The anticipation builds up as you drive south from Swakopmund towards Walvis Bay, destination Namib-Naukluft Park and Sandwich harbour. The headlights of cars brighten the stretch between desert sand and sea in the early morning light as you pass women collecting mussel shells on the shore, the Damara tern breeding area and the guano platform. Eventually, lines of palm trees usher you down the channel south until flamingos stamp the shallow waters of the lagoon next to the roads, and the white heaps of sand mark the salt works and the entrance to the park. A neat-looking guide had collected me from my Swakopmund guesthouse, greeting me with a warm handshake as I climbed into the Land Rover. As we drove into the dune sea of the Namib-Naukluft Park, I could see the desert fast transforming him. “One of the perks of my job is to go barefoot to the office,” he said. What Ernst Ritter referred to as ‘his office’ was actually his playground. I watched as he took off his shoes and threw them into the back of the vehicle, donning his worn bush hat to show us fossilised mussel shells and middens in the sand, running to the sea like a child set free. And we, fortunate guests on a full-day Sandwich Harbour tour, absorbed his buoyant enthusiasm and were invited out to play. His exuberance and passion for this striking protected area of sand and sea have not been diminished in his eight years of guiding in the surroundings. On the contrary, the ever-changing scenery and conditions, and the sheer beauty of the desert, serve to inspire him, fanning a fire that continues burning strongly. As we drove, he shared his wealth of knowledge, not only about the flora, fauna and history of the remarkable wild and protected area misleadingly referred to as Sandwich Harbour, but about the entire coastal strip. He recounted the past when the ephemeral Kuiseb River burst its banks and ran down through the low-lying town on its rush to the sea, and residents rowed boats down the Walvis Bay streets. This occurred in 1963, and a dyke has since been built upstream to prevent a recurrence and to enable the desert town to develop. The houses no longer need to be built on stilts, although the desert sands still build up defiantly against the walls of the houses. Waves lapped up onto the beach against a backdrop of Kuiseb Delta hummocks, bordered by towering dunes, as we continued along the shore of the Namib-Naukluft Park, a conservation area that celebrates one of the most ancient deserts on Earth. A midden that Ernst pointed out held a treasure trove of history. 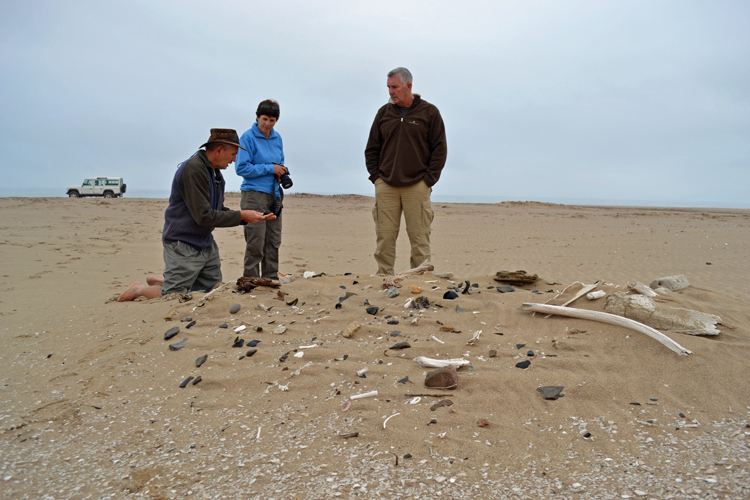 Old hand-blown bottles, cattle bones and ostrich eggshell beads were piled onto this small heap of sand in the vast Namib Desert – extraordinary remnants revealing the history of this section of coast. The first people to leave their mark, discarding shells from many a meal, were the Strandlopers, believed to be ancestors of the Topnaar or ≠Aonin people. After them came explorers, whalers and entrepreneurs. Diego Cão named the area Port d’Ilheo (point of the island) in 1486 when he sailed into the natural harbour. It was later a commercial fishing and trading port, attractive for its fresh water and supporting various industries such as whaling, fish processing, beef canning and collecting guano – unusual enterprises in this unlikely and desolate desert environment. Local people traded cattle for glass beads and supplies. Eventually, in 1890, when the sand spit protecting the bay broke off, the harbour became too shallow for ships to enter. People had to then make their way overland across the miles of desert. Today, only a few ruins and shell middens remain. The natural emerald-and-blue lagoon lies elegantly on the coastline of the Namib Desert, reclaimed by the birds, brown hyaena, black-backed jackals – and sand and sea. 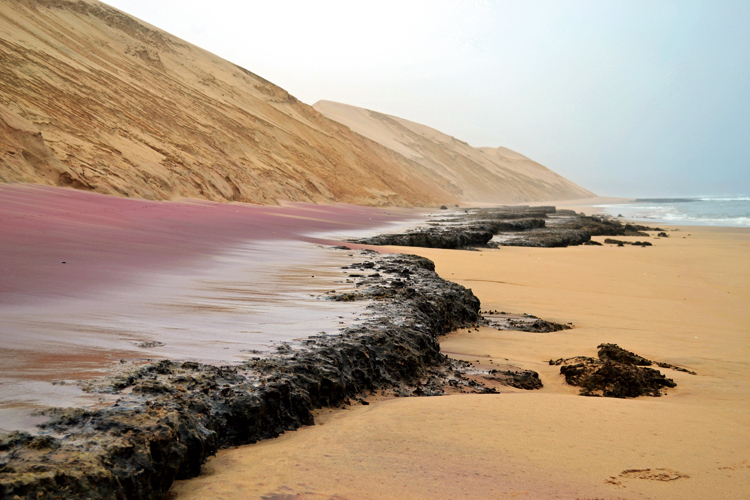 The wind had decorated the dunes with serpentine patterns and sprinkled them generously with black magnetite and pink garnet, and a sand wall had been sculptured expertly by the water. Dolphins frolicked in the waves and kelp gulls flew up in front of the vehicle as we made our way around the point where the dunes meet the sea, creating a small passageway that is accessible only during low tide. We drove through, content with the thought that we had a few hours to enjoy the treasure trove of Sandwich Harbour before high tide pushed in. Following the tawny sand etched with jackal tracks at the edge of the waves, we reached Sandwich Harbour itself and parked in front of the ‘no entry’ sign. The stretch of water edged by sandbanks and green with reeds where fresh water seeps down from the dunes, is a bird oasis. It was aptly named Anixas – Place of Birds – by the Strandlopers, the Hurinin, ‘people of the sea’. After a leisurely picnic breakfast, it was time to leave the vehicle and explore. Flocks of flamingos visiting Sandwich Harbour in the dry winter months stood in the calm waters, occasionally taking to the air in bursts of pink. Ernst began pointing out birds as we walked along the sand. “My first Damara tern of the season,” he shouted excitedly as he noticed one of the small birds hovering above the water. We walked through the iridescent wonderland, enraptured by desert, sea, bird and plant life merging so gracefully in this special place. Warmed up from the walk, we took off our shoes to cross the shallow water, stepping gingerly on sand circles stamped out by flamingo feet to reach the dunes on the other side. A short walk up and there, spread out in front of us, was the spectacular blue, green and ochre Sandwich feast. Ernst was now torn between hurrying us along so we could make it through the narrow passageway before the high tide came in, and pointing out birds and plants. Eventually, he managed to herd us back to the vehicle for the drive that saw us just make it through the narrow passageway as the waves began to crash over and seal the entrance for the day. And then the rush was over, and it was back to the playground, this time driving in the dunes, dipping and cresting the sand waves, and creeping slowly down a slipface to hear the dune roar a greeting, in acknowledgement of us ‘children’ playing so happily in the desert. 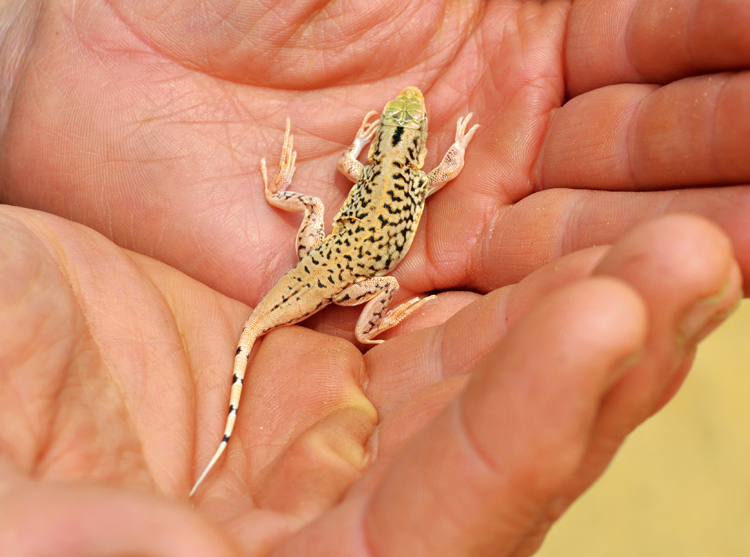 Ernst continued to educate us, finding a shovel-snouted lizard in the sand, showing us the prickly !nara plants that the Topnaar people depend upon, and digging holes for water in the riverbed like the jackal. As we left the dunes to travel along the Kuiseb hummocks, this time on the dune side, we braked for ostrich, to watch a contented group of springbok, and once again for the flamingos as we neared Walvis Bay and followed seals surfing the waves. We had surfeited on beauty by the time we arrived back in Swakopmund at the end of the day. The landscape, seascape and natural wonders had filled us up, replenishing us for future days. 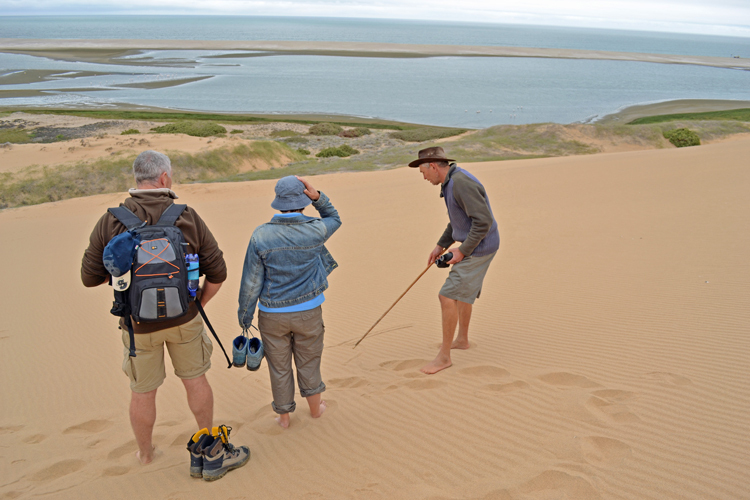 We were left with red wind-burned cheeks and sandy feet, and when they were gone, memories and photographs to take us back to the bay of plenty and our Sandwich feast in the Namib-Naukluft Park. Sandwich Harbour is a natural lagoon on the coastline of the Namib Desert in the northern section of the Namib-Naukluft Park, approximately 50 km south of Walvis Bay. It is a marine sanctuary and Ramsar site supporting more than 50 000 birds in the summer and 20 000 in the winter, including Palaearctic waders and flamingos. Considered one of the most important wetlands in Southern Africa for waterbirds, it is far more than a magnificent salve for the soul. Its value in conservation terms is immeasurable. Sandwich Harbour consists of a northern freshwater wetland and southern mudflats. 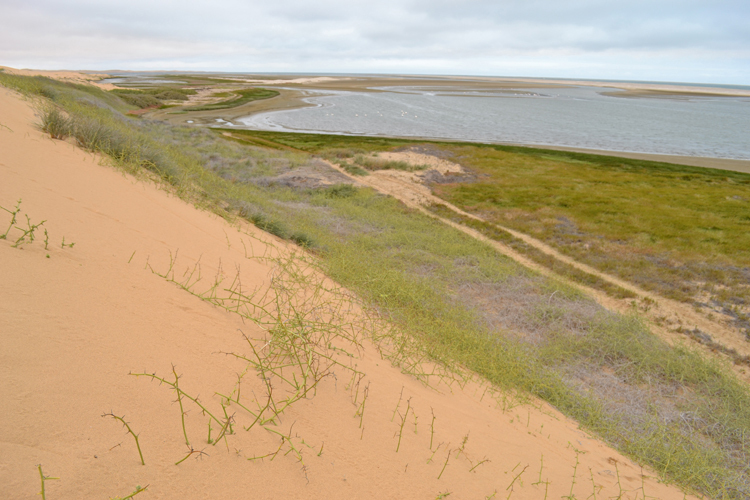 The northern section is a thin strip, fed by a freshwater aquifer below the Namib dunes that seeps into the wetland, and bordered by a barrier beach protecting it from the crashing Atlantic Ocean. The southern lagoon is a shallow stretch of water 5 km long by 3 km wide, shielded by a sand-spit. 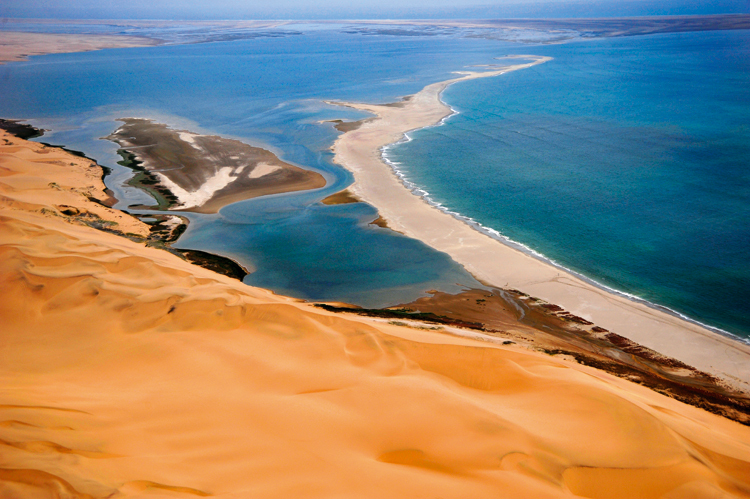 Sandwich Harbour is considered to be one of the most geomorphologically active areas along the Namib coast, changing and evolving continually, with its sandbars and beaches shifting with storms and currents. The origins of the name Sandwich are unclear, with possibilities ranging from the name of a ship visiting the bay in the late 18th century to the German name Sandfisch, meaning sand fish or sand shark. It was more likely named after the HMS Sandwich, a 24-gun armed ship purchased by the Royal Navy in 1780. In 1781 the ship had the misfortune of encountering the French fleet under Admiral de Grasse on the coast of the Carolinas and was captured by the 74-gun Souverain. The French sold her in North America soon afterwards. It is said that she was sent on an expedition to explore the west coast of Africa where she came to grief in 1792 in the bay now referred to as Sandwich Harbour. SANDWICH HARBOUR 4×4 offers a day excursion from Walvis Bay through the dry Kuiseb Delta to the massive dunes of the Namib-Naukluft Park and the breathtaking scenery of Sanwich HArbour. Depending on tides and sand banks, groups are driven down to the lagoon or view it from the lookout point above. Tables and chairs are laid out in the desert and a lunch of champagne and oysters is served. PLEASE NOTE: A permit is needed to enter the Namib-Naukluft Park, as well as 4x4 expertise and experience. Awareness of the tides and conditions are crucial, as high tide makes the shore road impassable. It is advisable to join a reputable and responsible tour operator to explore the area. Several operators run tours to the harbour from Walvis Bay or Swakopmund. This article originally appeared in the Travel News Namibia Summer print edition 2012.